Wiener Eislaufverein – Slide away! When I was little, my family and I used to come here regularly in winter time, that way I worked on my then still very shaky ice-skating skills and, the suburban kid I was, learned to appreciate passing time in the city. 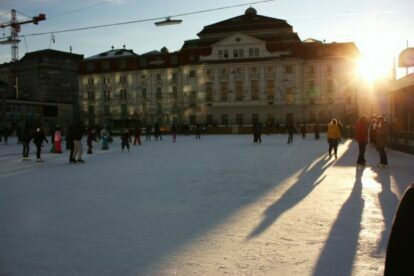 Wiener Eislaufverein not only represents a precious memory for me but also is a nice place for everyone to enjoy ice skating in the urban core. Wiener Eislaufverein’s character is diverse: sometimes calm and relaxed, on others lively and colourful. You should always check out their webpage before you visit, they might have something special planned for the day – an ice gala or a ‘Wunschkonzert’ afternoon, for instance. Also they organize some classy ice dance lessons and activities for little ones, so keep yourself updated! As the spot’s situated in the centre, you’ll have a nice view of another point of interest: Vienna’s Konzerthaus, located right next to it. Furthermore, both Stadtpark and Akademietheater are located nearby, so depending on whether your hands, feet and nose are coping with the cold, you can choose between taking a winterly walk through the park or going for a theatre visit to round up your day – I bet their wardrobe also accepts skates along with coats.